What makes the "E°UBM" type series so impressive is its enormous power density, multitude of modules, and simple manageability. With a width of only 11.5 mm per module, it saves space in control cabinets and, despite its very compact design, is extremely ease to wire. 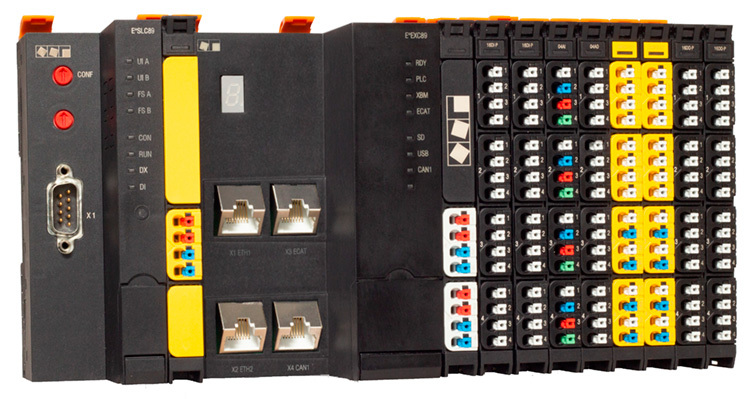 The type series is optimally designed for the "EXC89" CNC controller and allows centralized and decentralized I/O systems to be configured. For safety applications, special modules are available that can be used alone or in combination with the "SLC89" fail-safe control. All modul types at a glance. For further information see data sheet.